In this occasional ‘How To’ feature, the technical team at Resolve Optics provide you with useful instructions, hints and tips to assist you in your daily work. In order for your lens to provide its best performance it must be kept clean. In most working environments the biggest enemy to maintaining clean lenses is the dreaded fingerprint. 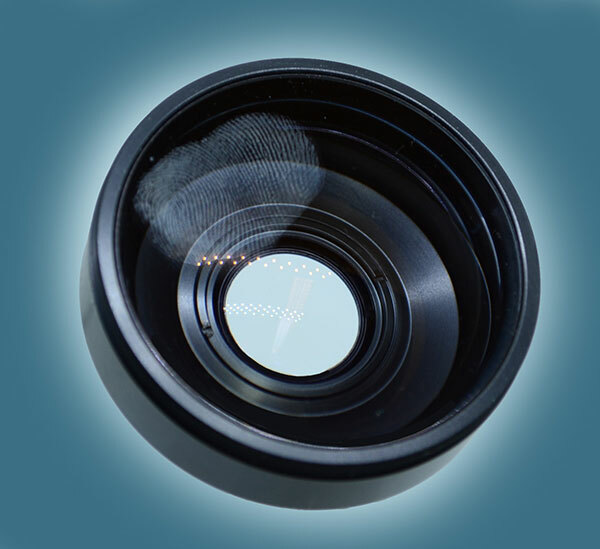 A fingerprint on the front or rear element of a lens can appear as unwanted marks in the image. If a fingerprint is allowed to stay on the lens for even a few hours it can damage the Anti-reflective coating on the lens leaving permanent marks which could seriously reduce performance. NEVER breathe on the lens or lick it. Your breath and saliva are more acidic than a fingerprint. NEVER clean the lens using tap water as minerals in the water can be abrasive and could damage the glass coating. NEVER wipe the lens with a cloth you just happened to have in your pocket. Even minute particles will scratch the glass coating causing permanent damage. If you do accidentally touch the glass and leave a finger print you should immediately clean the glass using a lens cleaning solution and a piece of lint free cloth. For further information on good practices for maintaining clean lenses please contact markpontin@resolveoptics.com.